Injection Rhinoplasty is a simple procedure used to lift or straighten the tip of the nose, camouflage a bump, or correct a crooked nasal bridge by injecting synthetic fillers into the aesthetic unappealing regions of the nose. The procedure can also be used to make a wide bridge or round tip appear more narrow and defined. Injection Rhinoplasty is an office-based procedure. It is a safe, non-invasive alternative to traditional surgical Rhinoplasty. While surgical Rhinoplasty is a good cosmetic procedure for patients with severe deformities, it remains an invasive surgery. Many patients remain hesitant about undergoing such surgery because of the potential complications and the risks. 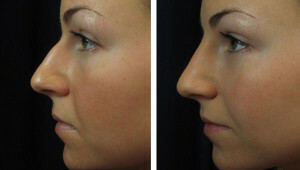 Injection Rhinoplasty avoids the complications typically associated with traditional surgical Rhinoplasty. Dermal fillers are a surprisingly simple, yet effective way of altering the appearance of one’s nose. Dr. Kam wants patients to be involved in the contours created and reshaping of the nose by the procedure. The injectable filler used is injected in small amounts and in specific locations of the nose. During the procedure you will be asked to look at your nose and provide feedback, meaning that you have total control over the end result. The results are immediate. Patients may resume regular activities immediately following the procedure. The results are instants and very fulfilling. Like other fillers most patients experience little if any side effects. No pain medications are necessary in 99% of patients. Dr. Kam recommends avoiding trauma or injury to the nose during the first few days after the injection. The cost of the procedure is dependent on the specific filler used and the quantities required to obtain desired results.